Competition for transit passengers has sparked rapid redevelopment at Moscow’s airports. The enhanced business and leisure facilities will soon include WiMAX technology, offering customers greater access to mobile broadband. Sooner or later the Moscow air transport hub will have to deal with similar problems. And this might be linked not only to ticket reservations but also to climate conditions. Despite global warming, a lot of snow still falls in many northern regions of Russia in winter, and transit passengers can quite easily run into flight delays. However, this was taken into account during construction of the new terminal at Sheremetyevo international airport. The new terminal is equipped with digital telephone systems (local and international) and internet access for both tenants and passengers. A Wi-Fi network has been built and call boxes have been installed, including some for disabled people. There is cable television, and there are plans to open a free cinema showing non-stop films. On top of that, the new terminal will offer the possibility of SMS authorisation for customers of Russian mobile operators. Comstar-OTS has installed 18 latest-generation call boxes in the new terminal, all equipped with detailed instructions in the main European languages. Comstar-OTS has been working with Sheremetyevo airport for more than 15 years. One of the biggest telecommunications operators in Russia, it built its own fibre-optic network at the airport. A fully functioning automatic telephone exchange has been installed, and world-class manufacturers, such as Cisco and ZyXEL, have been used to supply data transmission and internet access technology. Despite the fact that the private Domodedovo airport has taken the lead in terms of passenger numbers in recent years, Sheremetyevo began to bring in innovations in its telecommunications much earlier than others. Thus, wireless access to the internet became available in the old Terminals A and B (formerly Sheremetyevo-1 and Sheremetyevo-2) as long ago as 2004. 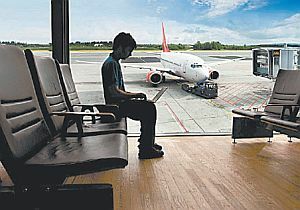 (Rival airports Domodedovo and Vnukovo launched their Wi-Fi networks only in 2007.) Also, in 2007 Sheremetyevo was the first airport in Russia to install self check-in facilities. Domodedovo can claim to have been ahead in catering to passengers who have to wait a long time for their flight, either because of weather conditions or because of transit timetable errors: a DVD cinema came into operation there in 2004. However, everything may soon change on the Russian telecommunications market. Moscow and other major cities are actively developing wireless WiMAX networks, and two companies are already offering 4G internet access in the Russian capital, including Comstar-OTS. The company has already applied for the necessary radio frequencies in the Moscow region, and is planning to set up 100 additional base stations in this area. Any passenger who has a mobile device supported by the appropriate technology (for example the ColibriComstar universal netbook with built-in WiMAX, 3G, Wi-Fi and GPRS/EDGE modules) will thus be able to gain access to the internet and fill their waiting time with any entertainment they wish. And they will no longer be dependent on Wi-Fi hotspot areas, since the WiMAX technology will enable them to move freely throughout the whole of the airport and the city.